ONGC Recruitment 2019: Apply online for AAE, Chemist, Geologist & Other posts @ ongcindia.com. Oil and Natural Gas Corporation (ONGC) Limited has begun the application process for recruitment of executives in E1 Level posts or Assistant Executive Engineers AAE, Chemist, Geologist and Other posts. ONGC had announced 785 AEE vacancies in March this year. The vacancies have been announced for Assistant Executive Engineer, Chemist, Geologist, Geophysicist, Materials Management Officer, Programming Officer, and Transport Officer. Eligible candidates can apply online through ONGC's official website. Oil and Natural Gas Corporation Limited (ONGC), a "Maharatna" Public Sector Enterprise, is one of the largest Crude Oil and Natural Gas Company in India, contributing around 70 per cent to Indian domestic production. 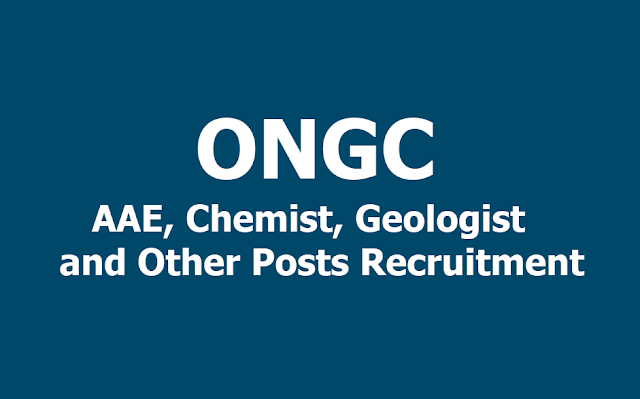 Oil and Natural Gas Corporation Limited (ONGC) has invited applications for the recruitment of AAE, Chemist, Geologist & Other Vacancies through GATE 2019. The eligible candidates can apply for the same through the official website of ONGC- ongcindia.com- from today, i.e., April 5, 2019. The last date to apply online for the recruitment AAE, Chemist, Geologist & Other posts is April 25, 2019. It is to be noted that candidates can apply for a maximum of four posts in order of preference. Candidates belonging to GEN/EWC/OBC/Ex-Serviceman categories need to pay Rs 370 for the registration. SC/ST/PWD candidates are exempted from paying registration fees. Eligible candidates should visit the official ONGC website (www.ongcindia.com) to apply for this recruitment. Candidates can apply for a maximum of four posts as per their qualification. The candidate will have to provide choice of posts in order of preference. The application fee for General category, EWS, OBC, Ex-Servicemen is Rs. 370. There is no application fee for SC, ST, and PwD candidates. Following are the documents candidates required for the ONGC recruitment registration. 2. Active Email id and mobile no registered for GATE-2019 application process. 4. Please note that an OTP number will be generated while entering the data for online application and the OTP number will be sent to the Email ID and Mobile No. entered by you in GATE-2019 application. After entering the OTP number only the registration process can be initiated and completed. 5. Caste certificate for entering community details (if belongs to OBC/SC/ST). 6. Challan form downloaded and duly filled with the applicable fee deposited and acknowledged by the concerned bank (if belongs to GENERAL/EWS/OBC). The selection parameters are GATE score, qualification, and interview. Weightage for GATE 219 score is 60 per cent, weightage for qualification is 25 marks (20 marks for essential qualification and 5 marks for in line PhD), and weightage for interview is 15 per cent.